I attended Chamber Music Northwest's presentation of "The Silver River," an opera written by Bright Sheng with a libretto by David Henry Hwang and followed it up with a review that is now posted in Classical Voice North America here. I hope that you enjoy reading it. On this day in 1966, Alfred Hitchcock's thriller "Torn Curtain" opens in New York — without the film score that Bernard Herrmann had composed for it. The famous director fired Herrmann during the score's first recording sessions when Hitchcock discovered Herrmann had composed a "symphonic" score and not the "pop" score that Hitchcock had specifically requested. It's gonna be hot, but if you can keep cool, you'll enjoy the open-air concert this Thursday in downtown Vancouver where the Vancouver Symphony under Ken Selden will perform a program of light classical music for free. My preview about the concert appeared in The Columbian newspaper here. It was on this day in 1829 that William Burt received a patent for the "typographer." It was a typewriter that looked more like a record player. It had a swinging arm that picked up ink and then printed a letter, and then the paper was manually adjusted to make space for the next letter. Alasdair Kent as Don Ramiro and Kate Farrar in the title role | Photo by Cory Weaver/Portland Opera. 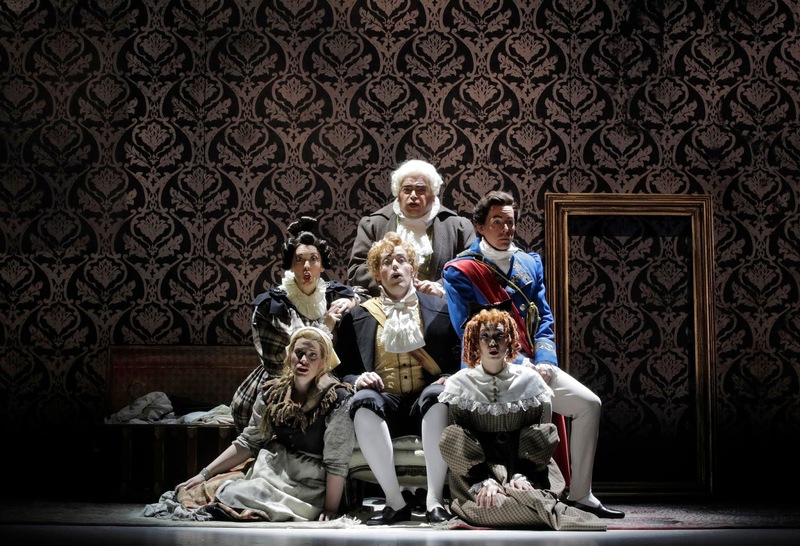 Among the many notable productions that Christopher Mattaliano has directed at Portland Opera, the company’s new production of “La Cenerentola” has to be counted as one of his best. 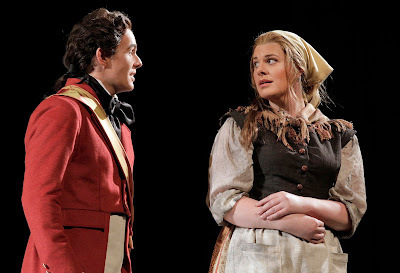 The performance on opening night (Friday, July 13) at the Newmark Theatre sparkled with humor and heartfelt, poignant moments. 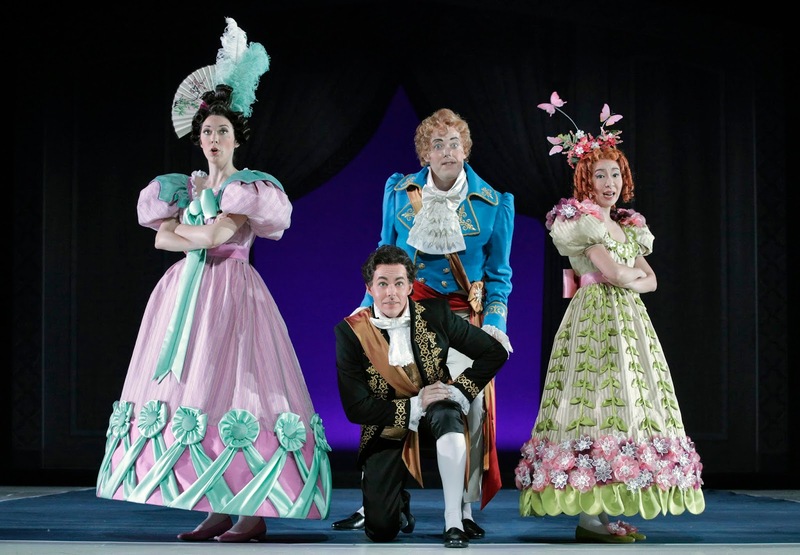 An outstanding cast, consisting of up-and-coming young talent and seasoned veterans, blended seamlessly to make the well-known story of Cinderella a fresh and enchanting experience. The production featured inventive and expertly paced acting that kept the audience wondering what would happen next. The comic scenes had everyone in stitches, like the rivalry between Cinderella’s bad sisters, which started with ballet-posed-one-upmanship and accelerated to hilarious extremes with both of them rolling across the floor in a mock cat fight. Yet there were plenty of moments when genuine seriousness came through equally strong, such as after Cinderella and the prince lock eyes for the first time in the “Un soave no so che” duet. Kate Farrar in the title role combined a supple and powerful delivery with superb acting to sweep even the most reticent listener into her character’s aura. Her singing of Nacqui all’ affanno embodied grace and kindness that wrapped up the opera in wonderful bow. Australian tenor Alasdair Kent excelled as Don Ramiero (the prince), and while his voice at first seemed a tad thin, he just kept getting better and better throughout the evening. He sang all of the high notes with a golden tone, including the stratospheric ones in the Si, retrovarla io guiro aria. 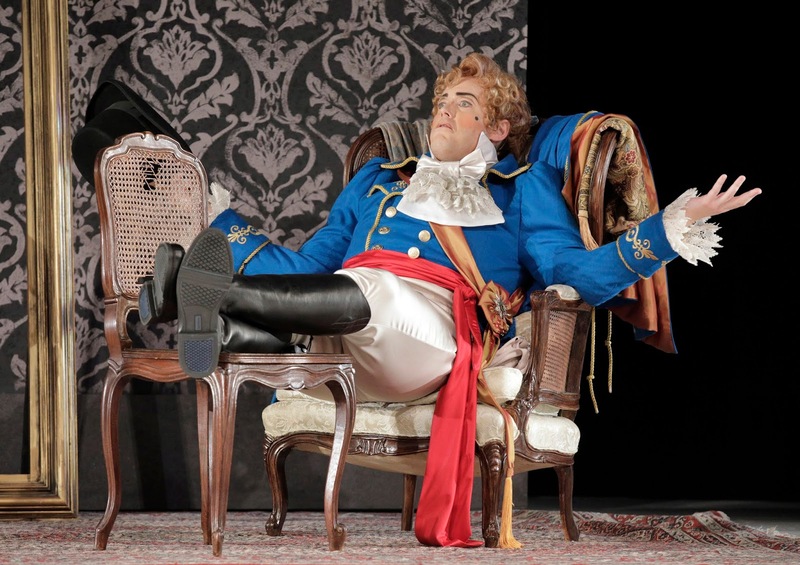 Ryan Thorn as Dandini | Photo by Cory Weaver/Portland Opera. Ryan Thorn was an absolute stitch as the prince’s valet, Dandini, especially when he melodramatically fell to the floor after realizing that he couldn’t win Cinderella. Eduardo Chama raked in the laughs as the pompous and bumblingly malevolent Don Magnifico, threatening to steal the show at any moment. 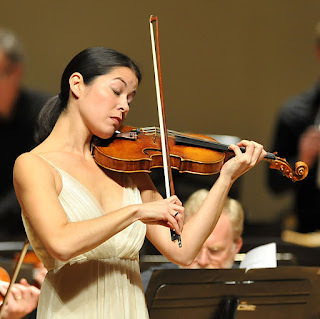 Helen Huang’s Clorinda and Laura Beckel Thoreson’s Tisbe were absolutely mesmerizing with incredibly well-timed gestures and expressions that perfectly matched up with the corresponding musical phrase. Daniel Mobbs created Alidoro, the stately philosopher-tutor-magician, with a warm, sympathetic voice. The chorus of leaping footmen made each of their entries a wonderful diversion. But whenever they moved away from the front of the stage, they were hard to hear, owing to the very dry acoustic of the Newmark. Despite the small size of the Newmark’s orchestra pit, Carolyn Kuan got a lot of sound from the chamber orchestra and paced her forces with verve. Still, some more strings would have improved the overall sound, which got rather thin at times, not matter how much she gestured. 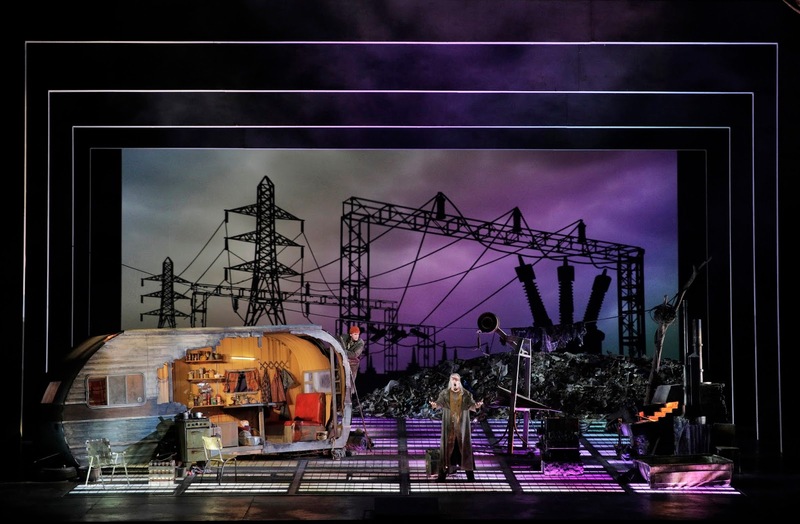 The sets, designed by Daniel Meeker and built by Oregon Ballet Theatre for Portland Opera, were straightforward and evoked everything in the story without being gimmicky. Sue Bonde’s fanciful costume designs were terrific, especially the gaudy outfits that Clorinda and Tisbe wore. If there were some way to improve the sound of the Newmark Theatre, the production would have been even more satisfying. The Newmark has a very dry acoustic that does not favor music. Someday it would be terrific if Portland had an excellent space for opera, then a production like “La Cerentola” would be truly magical. The program presented on Sunday July 15 at the Lincoln Performance Hall as part of the Chamber Music Northwest summer festival was a rich repast featuring works from the most spare, stripped-down solo work to sumptuous sound walls from an eclectic barrage of instruments. Clarinettist Benjamin Lulich played Stravinsky's Three Pieces for Solo Clarinet to open the program. The rich, woody timbre he employed in the opening, and the weight of importance placed on each individual note lent the air of a self-conscious, mildly sad threnody with a long, slow, riveting decrescendo al niente at the end. The finale felt like a slightly wonky klezmer tune, marvelously short, sweet and delicious, like a musical petit fours. Flutist Ransom Wilson followed this with Debussy's iconic Syrinx for solo flute, playing with a sinuous, serpentine clarity of line and skillful manipulation, varying timbre even across individual notes. Jean Cartan's (1906-1932) Sonatine for Flute and Clarinet was next, as Wilson and Lulich joined forces for a Pastorale that opened as curious ricercar followed by a murmuring accompagnato for flute, and there were fascinating times when the duo managed to sound like two flutes, or even two clarinets. The Berceuse was characterized by a warm, buttery 4-note ostinato from the clarinet, and they reveled in the dissonant cadences of the Rondeau. Jacques Ibert's Suite from Le jardiniere de Samos saw the woodwind players joined by Mikio Sasaki on trumpet, Jennifer Frautschi on violin, Mihai Marica on cello, and percussionist Ian David Rosenbaum.Highlights from the Ibert included Frautschi's dancing, 2-note saltando chords in the Air de danse, the 3-voiced fugue with delightfully bouncy entrances, and the incredible efficacy of the ensemble playing in bringing out the highlights from amongst a welter of interweaving lines. Stravinsky's Suite from L'histoire du soldat comprised the second half of the afternoon, and for it the Ibert ensemble (minus cello and flute) were joined by Charles Reneau on trombone, Peter Lloyd on bass, and bassoonist Julie Feves, who also provided a delightful narrative of the tale before the music started. In the opening movement Lloyd's staccato was so biting that at times it sounded like a pizzicato. 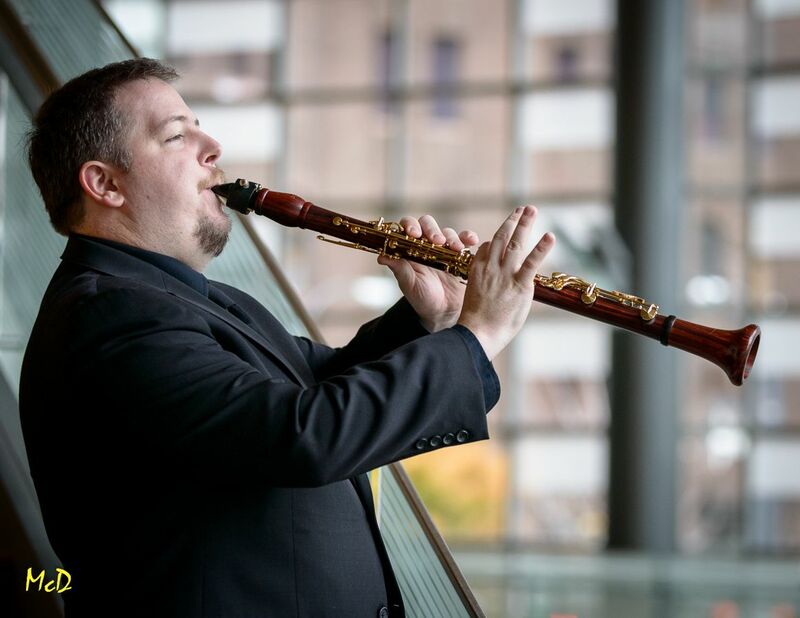 Frautschi's double-stopped air in the second movement was truly engaging, and the lines were tossed so seamlessly between bassoon and trombone it was sometimes difficult to tell where one instrument ended and the other began. The Pastorale was played as a sad and evocative duet between bassoon and clarinet. The wild and wonderful staccato trumpet theme from the Royal March was another highlight, and during the Three Dances Frautschi played a languorous tango, redolent with mystery, and a slow and staggering ragtime. The Grand Choral was appropriately reverent, and the group rendered it like the odd modern cousin of a chorale at the outset of a Bach cantata. Such incredible variety over a short concert (perhaps an hour's worth of music) is one reason why CMNW is such an important part of the region's cultural landscape, and further is an example of the ingenuity of the programming. My review of CMNW's "Sounds from 20th Century America" concert has been posted in Classical Voice North America here. It was a fun concert to hear, and I hope that you enjoy reading the review! 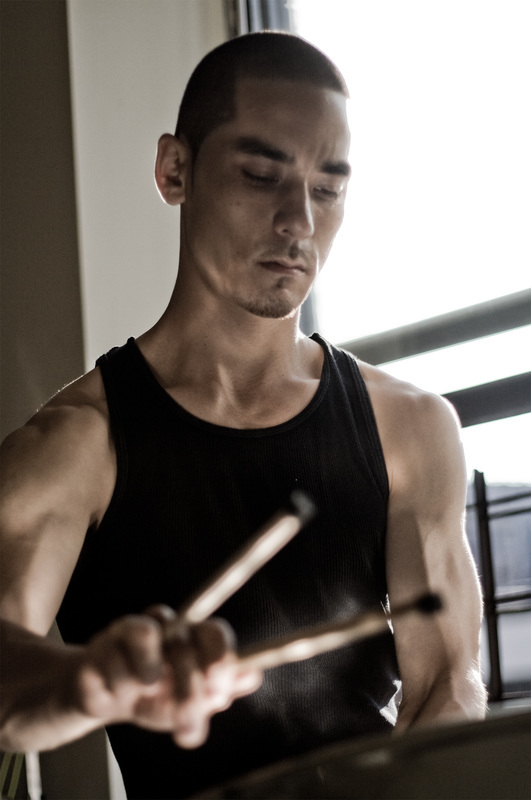 Returning composer/performer Andy Akiho and friends gave a memorable concert on Wednesday July 11 at the Alberta Rose Theater, as part of CMNW's Summer Festival. Akiho's reputation (and audience) have grown over the years, as the packed house that night proved. Joining Akiho, who performed several works on his primary instrument the steel pan, were Ian David Rosenbaum on marimba, Tara Helen O'Connor on flute, Jennifer Frautschi on violin, and the members of the Dover Quartet, violinists Joel Link and Bryan Lee, cellist Camden Shaw and violist Milena Pajaro-van de Stadt. The decision to mic all the instruments at first was puzzling; in the opening work the flute came off as excessively shrill at parts, but balance issues were fine and did not favor one instrument over another, and it was clearly what the composer had in mind so while initially off-putting, through the course of the concert his choice bore fruit. Karakurenai was next, with Akiho and Rosenbaum, and was a work for prepared steel pan featuring chop sticks, poster tack and other items according to Akiho. Based around a rigid, lengthy syncopation, this shorter work had a repetitive feel that could be meditative in the right circumstances. Deciduous, featuring Akiho and Frautschi, came third. The opening highlighted the strangely mellifluous, odd almost tonal-shifting attack and decay from the steel pan. Radically shifting moods, from frenetic and harried to placid and thoughtful took place instantaneously, leaving the listener never quite sure of anything except where they were at at the moment. A series of harmonic shrieks from the violin over a whispering accompaniment from the pan was followed by an odd, chaotic chase. Some of the most violent and painful-sounding pizzicato I've ever heard--almost diabolical--and then a beautiful soliloquy from the pan, a joyous air and a pentatonic fantasy...this was a fantastic and engaging piece. 21, a piece Akiho and Rosenbaum performed here before, left an impression that perhaps for Akiho, often (but certainly not always,) the rhythm is the mistress, and varying pitches and timbres, melodies and instruments, exist merely to service it. The second half consisted entirely of the LIgNEouS Suite, a work some of whose movements were commissioned by different groups, with the fifth and final movement being commissioned by the Dover Quartet, who performed it along with Rosenbaum. This performance was its west coast premier. It opened with sul ponticello scritching from the strings, and a repeating pattern over a wild and intense performance on the marimba. 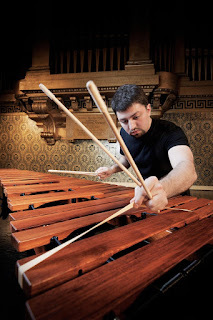 Wailing away with mallet shafts bereft of their yarn heads, Rosenbaum performed incredibly rapid arpeggios and scale passages with alacrity, now raking the sticks across the marimba tubes in a cacophonous glissando, followed by hard, alarmingly loud snaps from a giant rubber band. The strings sang an unlovely but fascinating accompaniment. This and other movements may not have been a marimba concerto exactly, but they came close. The second movement began with a ghostly suppuration from the strings over a murmuring marimba, struck with very soft heads that resulted in dissonant sostenutos as the notes hung in the air long after being struck. In this and in earlier pieces, unisons occured amongst the instruments that provided a fascinating sonic color due to the disparity amongst them. Later in the work came more startling effects from the marimba, alternatively purposely assaultive and mysteriously otherworldly. Gloriously loud, stark chords came from the strings, and strange sawing sounds, wails, slaps and knocks on the body and fingerboards of instruments. Like all of his works, this exhibited exhuberant play with the world of sounds. Two things struck me most about this concert: first would be Rosenbaum's virtuosity on his instrument. As a percussionist I have played the marimba a number of times, so have some small inkling of the challenges this instrument presents. I have never heard it played, nor imagined it could be played, the way Rosenbaum plays it. Simply breathtaking-and here give some credit to the composer-but a lesser performer could not have attempted nor even dreamed of giving the kind of performance Rosenbaum did. It was absolutely astounding, the most technically astute and artistically intuitive kind of exhibition anyone could hope for from a true virtuoso. Being somewhat biased toward percussionists, I have often felt the they are sometimes given shorter shrift than they deserve in the world of classical/art music. Let anyone who feels that way hear a performance like this. Enough said. Another thing is the simple joy of not only hearing something you have never heard before, but maybe even hearing something that is unlike anything you have heard before. This is the great reward that exists for those who seek out new music, which is perhaps the foremost of so many reasons I always go to hear Andy Akiho when he is in town. 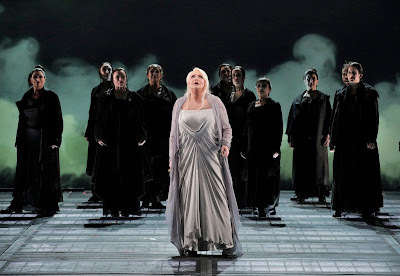 The final installment of San Francisco Opera’s Ring Cycle came to a close with a superb performance of “Götterdämmerung” at the War Memorial Opera House on Sunday, July 1. 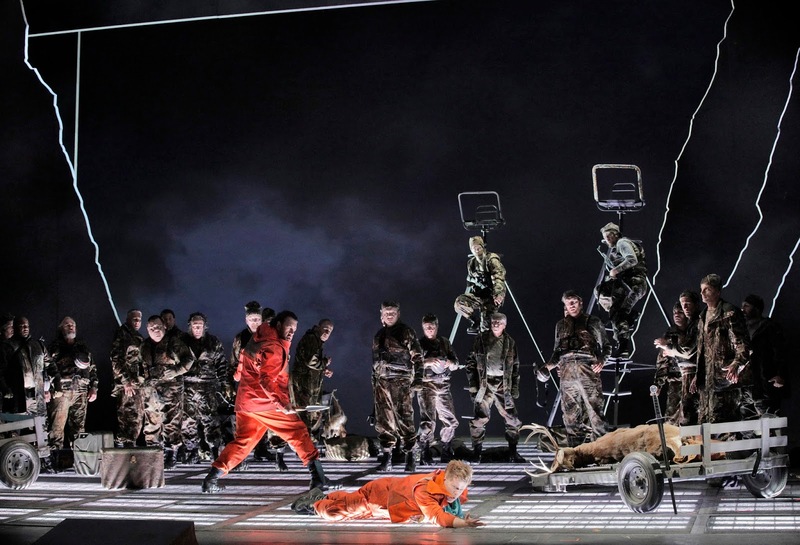 The exceptional cast delivered its A game with Swedish soprano Iréne Theorin and American heldentenor Daniel Brenna leading the way, and the orchestra, under Donald Runnicles collaborating with great sensitivity and panache. All in all, it was a terrific evening for the Francesca Zambello production that brought the third and final week of the Cycle to a glorious close. 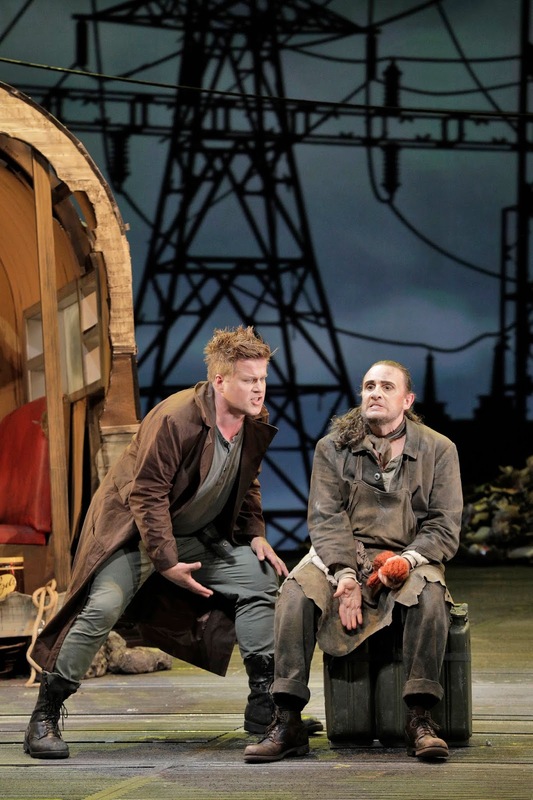 Theorin plumbed the depths of Brünnhilde with superb singing and acting. She went through the full cycle of emotions from ecstasy to despondency. Her rage against the betrayal of Siegfried was palpable. 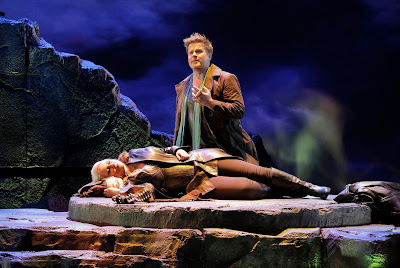 Brenna created a compelling Siegfried who unknowingly gets duped by the Gibichungs into winning Brünnhilde for Gunther. Brenna’s singing reached incandescent heights all the way to his character’s last breath. 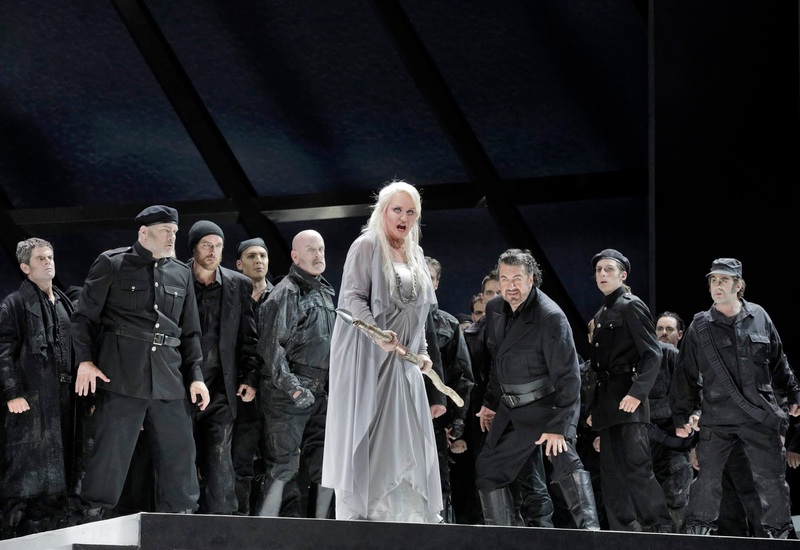 Andrea Silvestrelli was totally convincing in his role as the evil Hagen, and the scene in which he uses a knife and a spear to hold off the men after stabbing Siegfried in the back was mesmerizing. Falk Struckmann created a darkly sinister Alberich who invades the psyche of Hagen. Brian Mulligan deftly portrayed the weak yet conniving character of Gunther. His blood-brotherhood duet with Siegfried was powerful and repulsive at the same time. Melissa Citro went over the top in the role of Gutrune, adding a bit of humor when she tried to massage Gunther’s head and when she attempted to get the TV remote to cooperate. The three Norns (Ronnita Miller, Jamie Barton, and Sarah Cambidge) sang with distinction as they attempted to deal with a massive strand of cables. Their green garb suggested sanitation workers who had to make sure that they didn’t get contaminated. Jamie Barton pleaded fervently with Brünnhilde to return the ring to the Rhinemaidens (Stacey Tappan, Lauren McNeese, and Renée Tatum). That trio tried their best to entice Siegfried to give up the Ring even though they had to swim about the polluted Rhine River, contending with tires and trash bags. The theme of environmental degradation was placed up front and center with new projections designed by S. Katy Tucker, based on original designs by Jan Hartley and Tucker. The imagery complimented the scenery (Michael Yeargan), which was desolate and ominous. For example, the home of the Gibichungs was a glass-enclosed, modern affair that matched the soulless atmosphere perfectly. There were some questionable actions that occurred at the end the production: The Rhinemaidens capture Hagen and kill him by putting a plastic bag over his head. 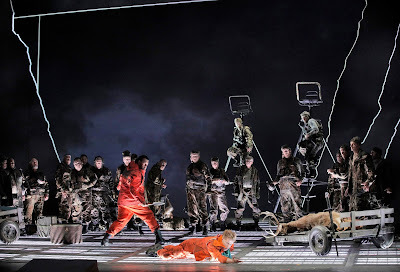 Siegfried was unceremoniously carted to the edge of the stage and dumped. Tires and bags of garbage were also thrown over the back of the stage and then gasoline was pitched onto it. It all seemed to be a very ugly way to signal an environmental cleanup and renewal of the earth. All that seemed to be forgotten when a young girl came out on the stage bearing a pot with a sapling, which, of course, signified new life. The opera chorus sang with gusto, and the orchestra played splendidly, fashioning a marvelous sonic experience under the baton of Donald Runnicles. All of the musicians and many of the technical crew joined the performers for the final curtain call as the audience responded with ecstatic applause and cheering. After the applause died down, Matthew Shilvock, general director of San Francisco Opera, came on stage to present the San Francisco Opera Medal to David Gockley, who was the opera company’s general director from 2006 to 2016. The medal recognized Gockley leadership in which he co-commissioned 11new works, presented 9 world premieres, and co-produced the Ring Cycle for its inaugural run during the 2011 season. 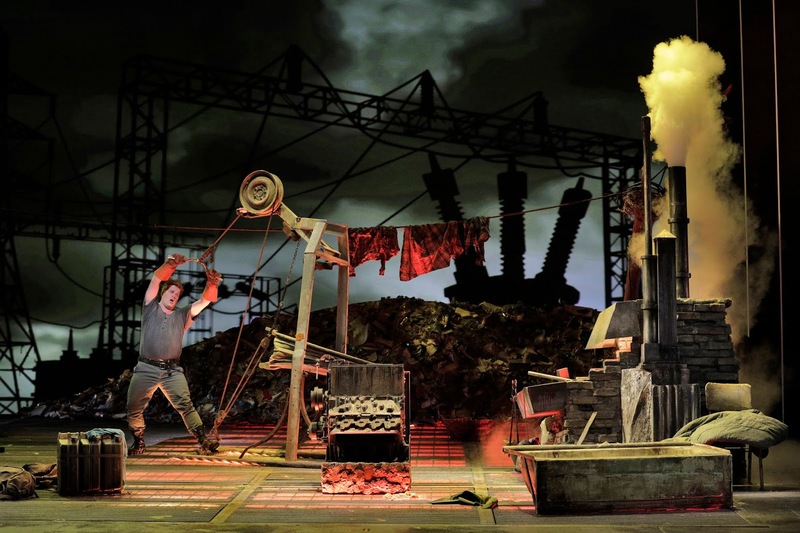 San Francisco Opera’s production of “Siegfried” (June 29) continued to file its environmental impact statement with projected videos and sets that emphasized an ugly planet. The bleak visuals didn’t detract from the exceptional performances by all of the principals, led by Daniel Brenna in the title role. The singing and acting was enhanced by an orchestra that again played at the highest level. The combined effect brought the audience at the War Memorial Opera House to its feet with cheers and thunderous applause. 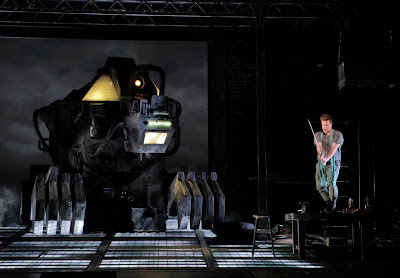 The videos (designed by Jan Hartley) showed a landscape of tree stumps and electrical substations, powerlines, train tracks, and spillage from an industrial wasteland. The stark picture was also conveyed in the gritty scenery (designed by Michael Yeargan) that revealed an old beaten-up trailer, car seats, and various debris to a makeshift-forge. In Act II an abandoned warehouse functioned as the lair for Fafner, who was ensconced in an armor-plated, tank-like vehicle that had claws. 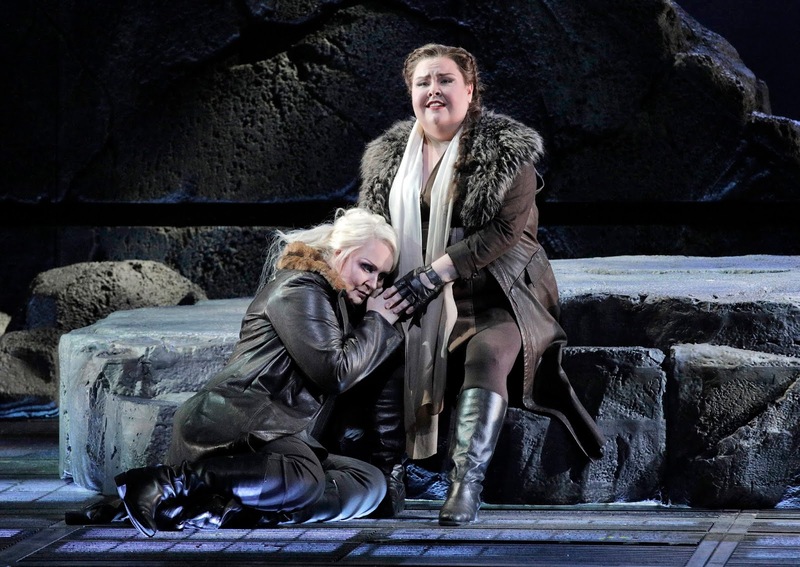 Brenna sang ardently and with great stamina to deliver an exciting performance as the impetuous Siegfried. 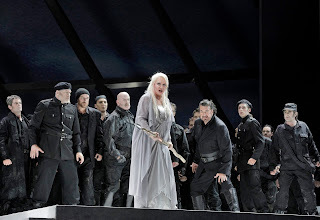 Brenna’s youthful look was a tremendous asset for this production, and he matched up well in all categories with Iréne Theorin, who embodied Brünnhilde with panache. David Cangelosi fashioned an animated and conniving Mime who was strangely likeable. Mime certainly got some sympathy when Siegfried waterboarded him to force him to reveal something about Siegfried’s parentage, and that didn’t stop Cangelosi’s Mime from executing joyful cartwheels in expectation of getting the ring. As Fafner, Raymond Aceto’s voice had a unique blend of strength tinged with regret. In the role of The Wanderer, Grimsley exuded a deep sense of resignation. 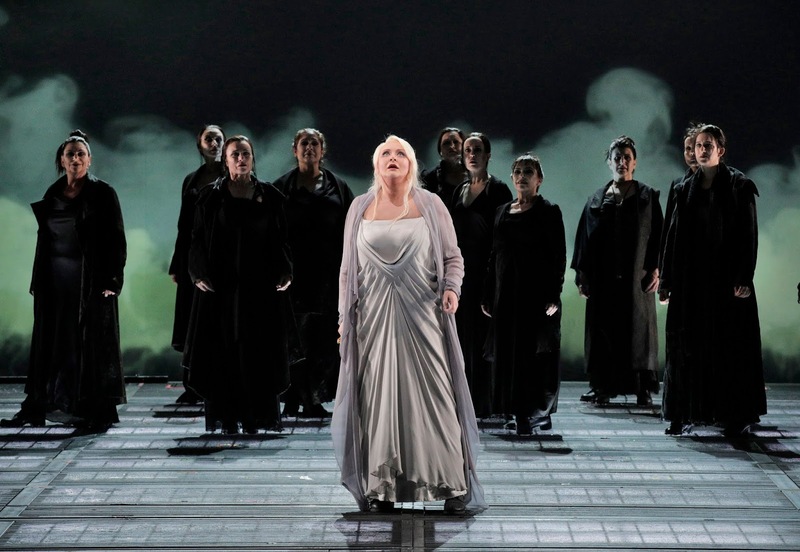 Ronnita Miller’s formidable mezzo issued Erda’s warnings with gravitas. As the Forest Bird, Stacey Tappan poured out a beautiful sound but needed a tad more sparkle. Her character fortunately shooed Siegfriend away from the idea of lighting a match after he poured gasoline on the dead bodies of Fafner and Mime. Falk Struckmann was a terrifically menacing presence when he threated Mime again. 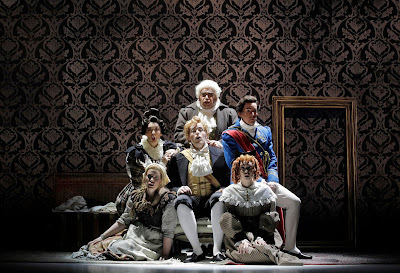 It would be difficult to overstate the outstanding playing of San Francisco Opera Orchestra. The musicians created all of the lush music with great sensitively, but they also incisively revved up the dynamics at the drop of a hat (or baton) with gusto. The French horn soloist played with incredible abandon, which made Siegfried’s calls wonderfully lively. Donald Runnicles deftly paced the orchestra and guided the entire enterprise with terrific verve. It was an exceptional evening and one of the best performances of “Siegfried” that I’ve heard. It’s the birthday of the Polish-French harpsichordist Wanda Landowska, born in Warsaw (1879). She’s been called the “rediscoverer of the harpsichord,” because she revived interest in the instrument during the first half of the 20th century. Landowska’s father was a lawyer and an amateur musician; her multilingual mother was the first person to translate Mark Twain into Polish. Landowska studied piano from the age of four. As an adult, she taught piano and harpsichord in Paris and Berlin. She began collecting antique keyboard instruments, and scoured libraries all over Europe for old musical manuscripts, which she copied. In 1903, she gave her first public performance on the harpsichord, and began a concert tour of Europe; in Russia, she performed for Leo Tolstoy. Although several composers wrote harpsichord pieces just for her, she was particularly fascinated by Johann Sebastian Bach and wanted to play his music in the most authentic way possible. In 1933, she made the first recording of Bach’s Goldberg Variations on the harpsichord. Her longtime companion, Denise Restout, later described feeling “stunned” when she heard Landowska play the Variations. “It was like being in front of one of the greatest works of nature,” she wrote. When the Nazis invaded France, Landowska’s house was looted and all of her instruments and manuscripts were stolen. She and Restout fled the country. She didn’t think the Nazi invasion would last long, so she only brought a couple of suitcases with her. Following an indirect route, they ended up on a ship to the United States, arriving on December 7, 1941. Ellis Island was chaotic because hundreds of Japanese people were being detained there. Landowska finally found a battered piano, and said, “We don’t know why we’re here or how long we’ll be here, so I can work.” They were finally allowed in the country after several prominent musicians wrote letters of support, and they eventually settled in Lakeville, Connecticut, where Landowska would live for the rest of her life. Over the past week I have been touring Germany with the Bach Cantata Choir. During a free evening while we were in Leipzig, I (and a few of my colleagues) heard Andris Nelsons direct the Gewandhaus Orchestra at the Gewandhaus. As you may know, Nelsons is the music director of both the Boston Symphony and the Gewandhaus Orchestra. So during the time we were in town, the orchestra was celebrating “Boston Week” with a variety of concerts, and the program on Friday, June 23, featured Stravinsky’s “Symphony of Psalms,” selections from Copland’s “Old American Songs,” Carter’s Concerto for Clarinet and Orchestra, and Bernstein’s “Symphonic Dances from West Side Story.” It was an outstanding concert in a hall with an excellent acoustic that makes the sound very lively. The “Symphony of Psalms” was a little louder and more emphatic than I have heard before. The first movement had punch and crackle to spare. The Gewandhaus Chorus, expertly prepared by Gregor Meyer, used very little vibrato and were able to match the dynamics of the orchestra. Nelsons guided the last movement with slowly drifting gestures to get the ethereal mood. The only thing that would have made the performance better would have been a projection of stained glass windows. The only complaint that I have about these settings is that at the end of several of the songs, Copland adds more instruments, which brings up the volume of the orchestra while the soloist has to sing in the lower range. Ergo, the last few words of several songs got obliterated. Perhaps Nelsons could have reduced the number of instrumentalists or just soften the tone. Fortunately, the text was printed in the program. Jörg Widmann, a virtuosic clarinetist and composer-in-residence with the Gewandhaus Orchestra, was the featured soloist for Carter’s Clarinet Concerto. In that piece, Widmann moved to different areas of the orchestra for each of the seven movements. For example, he played next to the harp for the first movement, “Scherzando,” moved to the brass for the “Deciso” movement, and moved behind the violas for the “Tranquillo” movement. Only in the final movement, “Agitato,” did he move next to the conductor. Much of his playing was percussive and the notes jumped all over the place. He played the ultra-high notes smoothly and with care. After receiving sustained applause from the audience, he was given a bouquet of flowers that he then gave to the principal flutist. The orchestra kicked into high gear for Bernstein’s “Symphonic Dances from West Side Story,” with the bass violins rocking out with their animated pizzicato-playing. The musicians showed no shyness when they shouted “Mambo!” Yet, they were equally adept at creating sensuous melodic lines that stimulated everyone’s of the memory of the love story at the heart of the music. Enthusiastic applause erupted from all corners of the hall after the piece concluded, and the musicians made sure that Nelsons received his due by not standing and letting the acclaim rain on him. Two retiring members of the orchestra received double bouquets, which was also thunderously recognized. It was a triumphant way to end the concert, and listeners left the hall with smiles and the feeling that they had experienced a very special evening. On this day in 1897, the Music Division of the Library of Congress is founded in Washington, D.C.